Cora Texas Manufacturing Company is located in White Castle, Louisiana in Iberville Parish. It is a sugar mill that produces raw sugar. In addition, it produces black strap molasses. The history of Cora Plantation and its sugar mill date back to 1817. Many of the first experiments in the manufacturing of sugar occurred on Cora Plantation and Cora factory. The Cora Sugar Mill contained the original "Cora" nine-roller mill built by Fulton Iron Works and designed by Martin L. Flowers, the progenitor of the vast family of Fulton mills now spread all over the sugar world. Cora Texas Manufacturing Company is managed by Paul Buckley Kessler, President and CEO, and Charles Schudmak, Secretary and COO. Charles is the fourth generation of the Kessler family in management of Cora Texas Manufacturing. Cora Texas Manufacturing Company has continued to expand its sugar factory and is presently grinding more than 16,000 tons of cane per day and often produces more than 4,000,000 pounds of raw sugar per day. 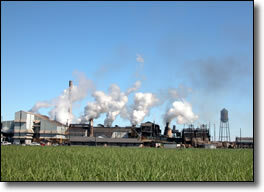 Today, Cora Texas Manufacturing is the second largest sugar factory in Louisiana. Thank you for visiting our site. Take a look around for more information regarding the Cora Texas Manufacturing's Production and Factory Operations. ©2003 Cora Texas Manufacturing Co.